The Japan Aerospace Exploration Agency (JAXA) began a satellite communication connection using the Engineering Test Satellite VIII "KIKU No. 8" (ETS-VIII) to support disaster measures following the Tohoku Region Pacific Ocean Costal Earthquake. 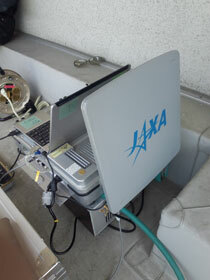 On March 24, JAXA set up a ground antenna and the movable test communication terminal for the KIKU No. 8 at the Ofunato City Hall to connect the communication line of up to 768 Kbps between the City Hall and the Tsukuba Space Center via KIKU No. 8 in cooperation with the National Institution of Information and Communications Technology (NICT) based on a request from the Ministry of Education, Culture, Sports, Science and Technology, which received a petition from Ofunato City, Iwate Prefecture. With this communication line installation, Ofunato City Hall workers began collecting information by PCs through the Internet. Apart from city hall, local fire departments and other offices can also now use the Internet and IP telephones to share information for strengthening their cooperative activities. In addition, as one of the special features of the KIKU No. 8 is communications with a small movable test terminal, which was installed at Ofunato City, information dispatch from evacuation centers and other places through the Internet became possible, because it is easy to move around and install it. Therefore, the connection this time is expected to further contribute to a smooth recovery from the disaster. 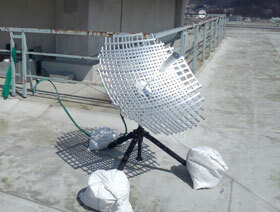 A movable antenna for the Wideband Internetworking Engineering Test and Demonstration Satellite "KIZUNA" (WINDS) has already been installed at the Iwate Prefectural Office (Disaster measures headquarters) in Morioka City and in Kamaishi City (Iwate costal broad area promotion office.) In addition, another movable ground antenna for the KIZUNA was set up in Ofunato City (Iwate costal broad area promotion office) according to a request from Iwate Prefecture. JAXA has been carrying out technological development of satellite communications that can assist in disaster measures using the KIKU No. 8 and KIZUNA, and we would like to continue our support activities for recovery from the disaster as part of our development efforts.